Songs of the Wanderers is also inspired by Hermann Hesse’s Siddhartha, a novel set in India about a young man who leaves home in search of enlightenment; the meandering river of golden rice we see on stage at the beginning of Songs of Wanderers suggests the river that both physically and metaphorically led Siddhartha from illusion to enlightenment. The wanderers of Lin Hwai-min’s Songs emerge from behind the dark backcloth and drift towards the river with tall staffs cut from forest branches. The monk is on the opposite shore under the cascading rice: set designer Austin M.C. Wang has thus created two rivers, one vertical and one horizontal. In Hesse’s novel Siddhartha annihilates the contradictions in words and thoughts, seeing the oneness in the reality in and around him. In the same way, Cloud Gate’s community of wanderers gradually removes the obstacle of the river by dissolving its banks: they pick up the rice to let it slip through their fingers, spread it with the force of their bodies in a series of tableaux and release handfuls high into the air. Rice also rains in intervals like a monsoon until the entire stage is covered, merging the two rivers into one. Songs of Wanderers is thus not so much a narrative as a journey in which the seeking spirit of the wanderers aspires to the spiritual influence of the monk. The opening section, called Holy River, sets the character of this journey beautifully; accompanied by a Georgian folk song recorded by Rustavi Choir, the dancers move with calm control, quietly advancing to the river, the uprights of their staffs contrasting with the smoothness of their slow, meandering paths. Out of this meditative prelude that blurs time and space, Lin Hwai-min’s choreography takes a more structured form, weaving ensemble and soloists (Ko Wan-chun and Wang Wei-min) in formal sections with theatrical effects that remind us of space and time. The two deluges of rice are visually stunning, but the first is a device to mask the entrance of Wang Wei-ming at the beginning of his solo and the second seems to have no other function but to replenish the rice on stage. In a work where the material aspect of life slowly erodes into the immaterial, these devices jar and leave me feeling I am watching from the outside rather than participating in the journey. Which brings me back to Wang Rong-ji. It is only when I see him move that I realise to what extent the physical body can represent the spiritual. Hesse uses the dialectic of words to point the way towards a reality that encompasses their opposition; in the physical realm, Wang-Rong-ji finds a corresponding unity between gravity and weightlessness and points to a qualitative development of movement. By contrast, the physical language of the wanderers does not develop beyond the earthy opening, suggesting a substantive divide between the physical and the spiritual; the transformative effect of their journey remains unfulfilled. Wang Rong-ji has been in the production from the beginning twenty-two years ago — Lin Hwai-min hired him specifically for the role — but the dancers in this production, apart from Wang Wei-min, are relatively new. Perhaps they are just trying too hard, like Siddhartha before he renounced his ascetic practices. 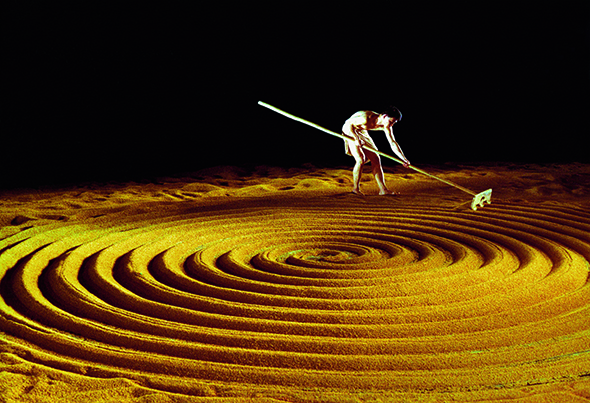 The final phase of Song of the Wanderers is the lone figure of Lin Hsin-fang meticulously raking the rice into a perfect series of concentric circles. He begins as the company takes their bows, when the concentration of the audience has already started to dissipate, and it must seem a strange ritual for those in the stalls who cannot see the pattern he is making. But in Lin Hsin-fang’s solemn, meditative gesture there is the signification of intent and, for those who can see it, the pattern he defines suggests the harmonious goal of all spiritual wandering.